Century Cycles Blog: Define your life...with mom at the triathlon! Little Patrick Hughes sports his "Define your life. Ride a bike." 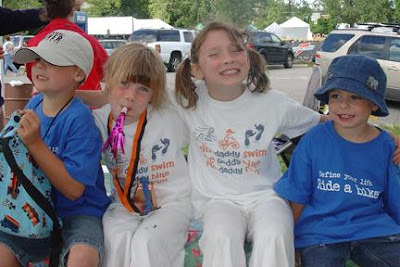 t-shirt at the Greater Cleveland Triathlon, where he and his brother Ryan (far left) cheered on their mom, Krista Hughes. They are joined by friends Laney and Kelsey Burns (center), who were excited to see their dad, J.B. Burns, compete. The kids must be good luck charms, because Krista placed third in her age group and J.B. placed 2nd. Congrats to the Hughes and Burns families, for their tri-triumphs and Patrick's good fashion sense! Thanks, Leslie Burns and Support Your Triathlete! GOT A COOL PIC? SEND IT IN! We love to see the photographic evidence of all the cool places you wear your "Define your life" t-shirts or ride your bikes. Please e-mail your pictures to info@centurycycles.com, along with info on who you are and where the picture was taken. If you're sending it in, we'll assume it's okay to put it on the Century Cycles website, or blog, or store bulletin board, or maybe even make it our Christmas card. Well, maybe not that last one, but you get the point -- you share it with us, we'll share it with everyone!